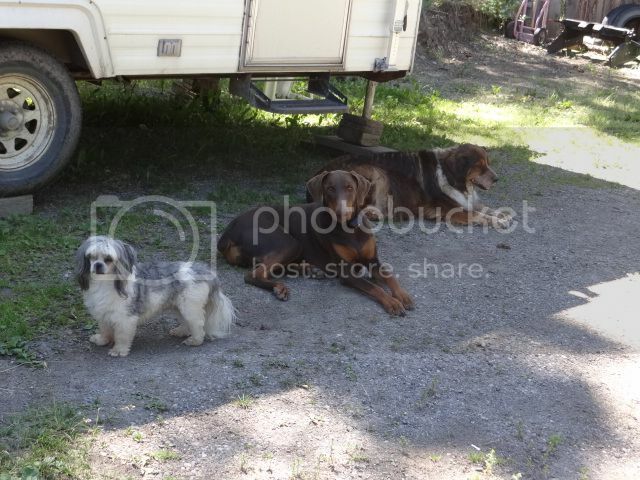 The temperature was over 30C (90F) today so all the dogs wanted to do was lie in the shade. The rest of them were in the house where it was cooler. I don't blame them one bit.. and besides, they look so great together there :-) Is it humid as well as hot? Not really humid and at least it cools off at night, down to about 50F at night so at least you can sleep. Lots more forest fires but no wind right now so no smoke. Great pictures. Our humidity was down too, which made it much better. Dunny and I did get in a nice walk as our field was mostly shady. However, when I wanted to sit in the shade and read my book, he wanted to go inside where it was cooler. I don't blame them either, they look very content considering the heat. Arny always sought out the shade to lay in the garden, Roly just stretches out in the sun, so I have to keep an eye on him. Sadie knows where all the shade spots are. She is disappointed that she can't get under the truck any more. What a lovely photo. At least they found a good spot. 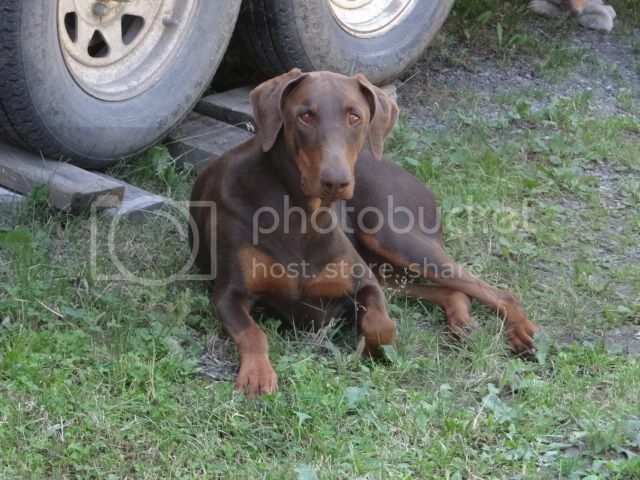 Love your dobe, looks a lot like one I used to have. Nice picture!!! Scooter usually finds shade. Harley could care less. When it gets too hot, I make him come inside.